I have been pondering this question about whether a CURRENCY is a set of rules that play out into the future, the state of a whole system at a specific time, or a representation of flows over time that manifested in the past. Linked to this question, is the question of whether a CURRENCY is deterministic and allows prediction about the behavior of systems as a whole, or whether it is open ended and only sets up a ground upon which interactions can play out. Perhaps we should think about chess. Chess has a set of rules that govern how pieces interact with one another, and it sets up a start point (board at opening) and end point (checkmate) for the system. The rules of chess allow for the manifestation of around 10^100 (a 1 with 100 zeros after it) different games, but the rules say nothing about which game will be played at any given time. The rules of chess are non-deterministic, but they set up boundaries of interaction, i.e. no rook ever moves diagonally. If we want to actually predict the way a particular chess game will manifest, we will have to study intently the history of the players and how they have chosen to deal with given situations in the past. We might even take into account whether the players got enough sleep before the game, and whether there is a lucrative prize for winning. In all cases where we are trying to predict a specific game, we need information that cannot be found within the rules of chess. Let’s look at a more biological example. Think of an ant colony. The behavior of the individual ants is relatively simple and probably determined in some way by the ant’s DNA, but the actual manifestation of a particular colony is highly complex and non-deterministic. This makes the ant colony quite different from a computer program, which will run the same every time. See Wikipedia's article on cellular automata for a great explanation of how this process differs from conventional computer programming. A good place to look to unpack this issue further is Ilya Prigogine’s theory of life being a dissipative structure. According to Prigogine, life is an OPEN system far from equilibrium. A non-living system is one that comes to rest as all interactions are played out. This resting point is its state of equilibrium. Systems that are closed tend towards equilibrium, but in living systems equilibrium is synonymous with death. 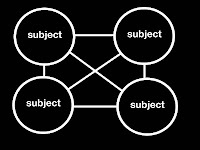 A system is dead when no more interactions are occurring between its constituent parts. This means that life must inherently be energetically OPEN to sources outside the system. Think of the earth as a whole. The earth is open to energy from the sun, and the sun is what keeps the whole earthly dance moving. This means that life is a pattern that maintains cohesion in a constantly changing stream of matter and energy. The other big piece of the definition of living systems, is that they can adapt themselves to changes in the environment. Warm-blooded animals maintain their body temperature across a wide range of external conditions; ants have adapted to live on six of seven continents, and so forth. A good place to read further on this is Wikipedia’s article on self-organization. 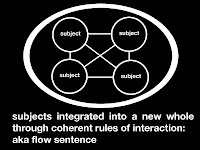 So how does this relate to the metaphors we have been using so far to explore the flow language? Let’s look a circuit diagram. A circuit diagram represents a system that is not evolutionary. Sure electricity moves through the system, but the structure of the system itself does not change depending on the conditions. Even if there are complex relations between the parts in a circuit that do allow it to change to match some external conditions, the determination of how the system will manifest cannot change except by outside agency (the electrical engineer). Hence, it is completely deterministic. Here is where we see the difference between living and non-living systems. In contrast, a living system modifies its own internal structure to adapt to external conditions in novel and creative ways. What is probably going on in living systems is something akin to a bifurcation in a chaotic system. It is inherently unpredictable for this reason, and is determined by conditions within the boundary of the system rather than external conditions. What makes this all especially complicated is the fact that living systems are within the realm of the biosphere, where as currency is more in the realm of the noosphere (mind). 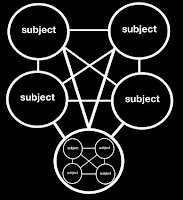 This means that meaning becomes part of the system. In biospheric systems, meaning isn’t really all that important to determining flows, but in noospheric systems meaning is an essential component. I think of currency design as permaculture of the noosphere. 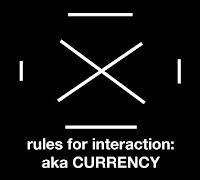 To sum up, in my humble (and very possibly wrong) view, a CURRENCY is a set of rules that govern a particular flow within a complex open system in a non-deterministic way. As multiple currencies interact, even predicating outcomes in the short-term becomes less and less feasible. However, this doesn’t mean that we can’t make useful statements about the system derived from these rules. One feedback loop a currency complex can have is the communication of the state of the whole to the parts. This information flow affects how the parts behave and helps create cohesion in the system. This view of the whole is the holoptic view. In fact, it is the ability of the parts to know and interact with the state of the whole that may give the system meaning as a whole in and of itself.